Sham Ramlal is an artisan/woodworker. He is an East Indian Musician, having studied Indian Classical Music up to 6th year of the bachelor’s degree program. He is also a singer of Ramayan and Trinidad Local Classical Songs. Sham was born into Indian Culture and learnt Hindi and Trinidad Indian Classical singing (Taan Singing) from his father and many other great singers from the Village of Esperanza in California Couva. He relocated to the Village of Mafeking in Mayaro when he was about twenty. Sham got Married to Mary Cynthia Ravello and has seven children. Sham has singlehandedly nurtured Indian Culture in the Mayaro area for over fifty years and continues to do so to this day. 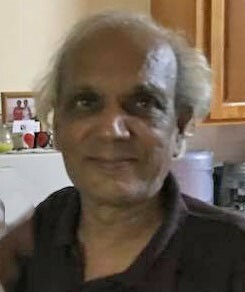 His knowledge and love of English Literature and Reading coupled with his knowledge of reading, writing and speaking Hindi has enabled him to write poems and stories such as these. Writing has been a hobby for most of his adult life and he began putting his poems together over fifteen years ago. Sham writes for the love of language and writing and continues to create stories and poems as he is now retired and has the time to devote to this pastime.